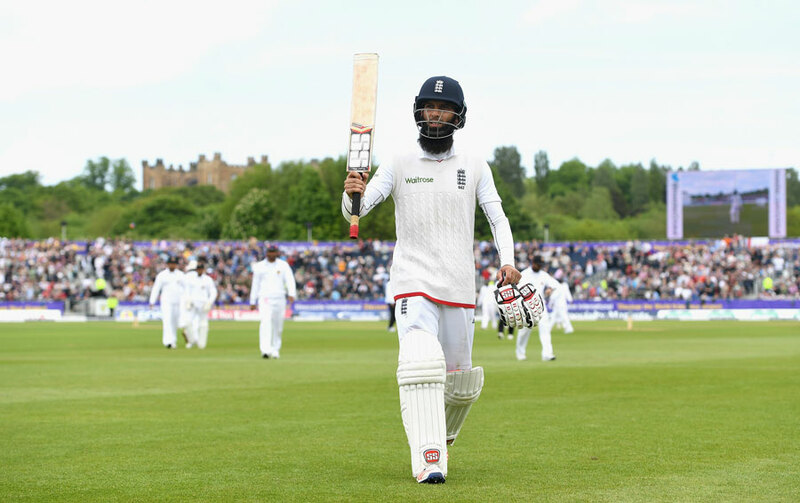 155* Moeen Ali's first-innings hundred is the third-highest individual score at Chester-le-Street in Tests. Ian Bell's unbeaten 162 against Bangladesh, in the was his third Test of his career in 2005, remains the benchmark. This is also the fifth-highest individual score batting at No.7 or lower for England in Tests and the highest for England at No.7 since Derek Randall's 164 against New Zealand in Wellington in 1983-84. 2 Number of centuries for Moeen in Tests, both coming against Sri Lanka. His maiden Test hundred, an unbeaten 108 at Headingley, came in the fourth innings of the second Test in 2014. He averages 79.25 against Sri Lanka, his best against any opposition. 276 Moeen's average when batting at No.7 in Tests, in three innings. Both his centuries have come at this position and he remained not out in both. His average is the best by a player at that position, without any cut-off. 3 Number of centuries by England's No. 7 batsmen in Tests this year. Jonny Bairstow scored 150 not out against South Africa in Cape Town and 140 in the first Test against Sri Lanka. There were just two centuries from that position for England in the previous four years. 300 Wickets for Rangana Herath in Tests. He dismissed Steven Finn as his 300th scalp to become only the second left-arm spinner and third Sri Lanka bowler to reach 300 Test wickets. 2014 The last time England had three partnerships of 50 or more runs for wickets six to nine in a Test innings. That was against India at The Oval. In this innings, Moeen added 70 runs for the sixth wicket with Bairstow, 92 runs for the seventh wicket with Chris Woakes and 72 runs for the ninth wicket with Finn. Between them, they raised England from 227 for 5 to 498 for 9 declared. This is their fourth such instance since 2011. Prior to that, they had only achieved the feat on eight previous occasions. 29.20 Average partnership for wickets six to ten against Sri Lanka in Tests since start of 2015 - the highest against a team in this period. 9 Average of Sri Lanka's openers in this series so far - their worst in a Test series of two or more matches. The highest score by their openers in the six innings so far is 14 by Kaushal Silva. Silva has reached double figures in all three innings so far (14, 13, 11), whereas his partner, Dimuth Karunaratne, has got out for single figures (9, 7, 0) each time. In each of Sri Lanka's three innings in this series, their first wicket has fallen with exactly 10 runs on the board. The current average of 15.35 by Sri Lanka's top six is also their worst in any Test series. 3 for 9 Woakes' figures (at the close of day two) - his best Test figures to date. His only previous three-wicket haul in his first six Tests was 3 for 30 against India at The Oval in 2014. Five days ago, he took 9 for 36 for Warwickshire against Durham at Edgbaston in County Championship, his best first-class figures. 98 Balls faced by Lahiru Thirimanne and Herath for the seventh wicket, Sri Lanka's longest partnership of this series. There have only been two other partnerships that lasted for more than ten overs, both coming in the first Test. 2011 Last time Sri Lanka lost their fifth wicket for less than 100 runs in three consecutive Test innings - against Australia in the two innings of the Galle Test and then the first innings of the subsequent Pallekele Test. Their scores at the fall of fifth wicket in this series are: 77, 93 and 67. This is only the fourth time in Sri Lanka's Test history that they have lost half their side within 100 runs in three consecutive Test innings.